Sri Lankan jaffna curry powder-chicken curry. curry worthy of the spice blend. 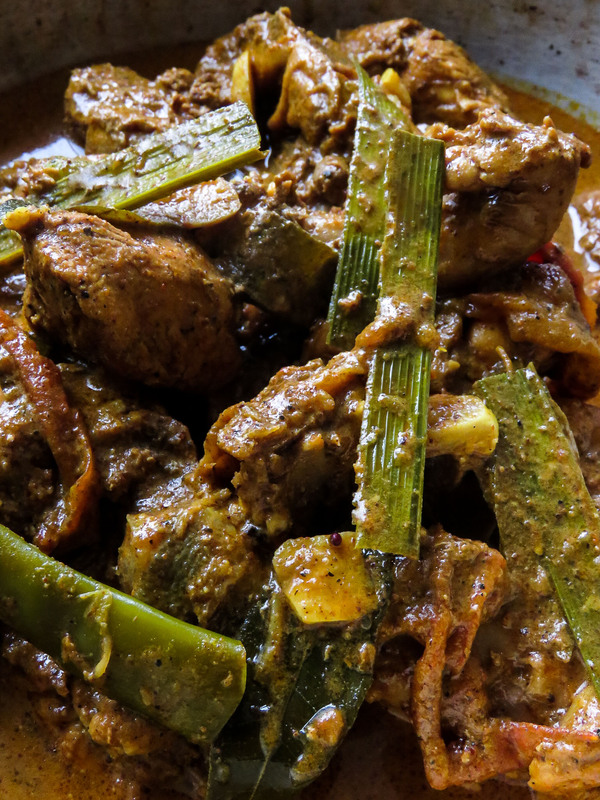 Be prepared to sweat, enjoy and savor a delicious chicken curry that is everything you look forward to in Sri Lankan cuisine. 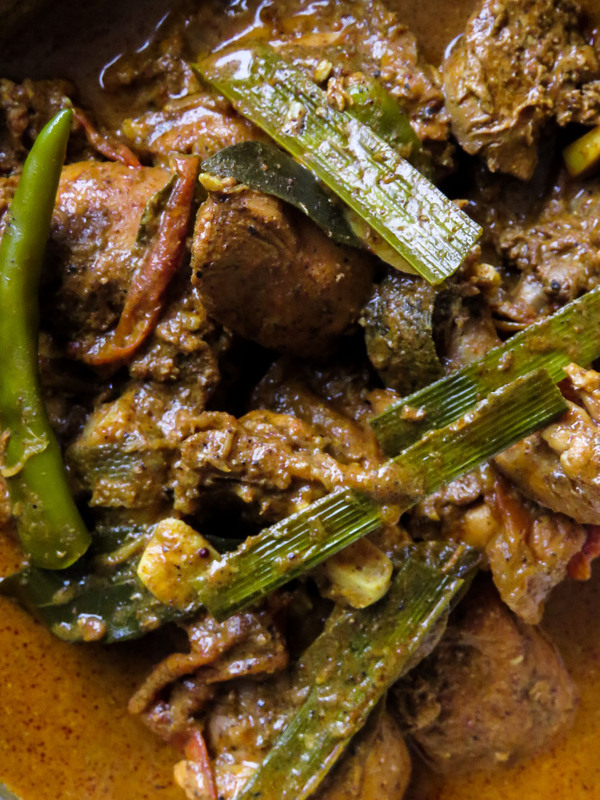 Especially when it comes to this meat dish, seasoned with homemade Jaffna curry powder. With a dark brown gravy rich in spices, this chicken curry is ideal for anyone who loves spicy food. 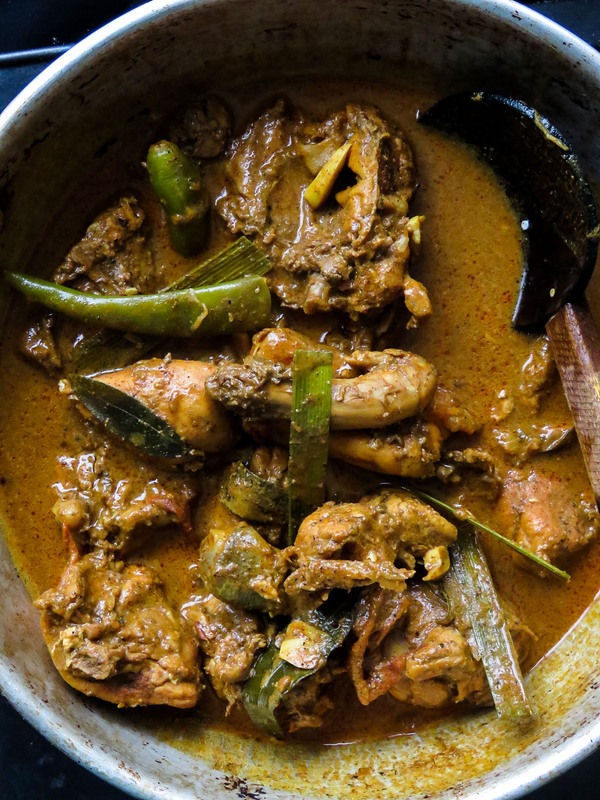 Furthermore, your rice and curry dish will taste better with this chicken curry. On my previous post, I mentioned my favorite curry powder and how much I loved cooking meat curries using Jaffna curry powder. If you missed my post on it, I would recommend reading it and making a jar of the spice blend. For those of you who like to eat extra spicy food, this is for you. It’s slow-cooked and comes together in a single pot using a few extra spices and ingredients to enhance the taste of the curry. Although using coconut milk is an option. For this recipe, I am not using coconut milk as I want to keep the dish spicy which in turn makes the gravy thinner than usual. Adding coconut milk will certainly give you a thicker and richer gravy but will certainly reduce the spiciness of the dish. If you do use coconut milk, here’s how you do it. Pour in 1/2 a cup OR 1 cup of coconut milk (depending on how much gravy you want). Season with salt accordingly and slow-cook until you have a thick gravy with tender spicy chicken. Chopping board to cut the ingredients and knife/cleaver to cut the chicken, a large bowl to marinate, large pot to cook the curry. parts to make the chicken curry? Yes, except for the wings, I include all parts of the chicken including the gizzard, neck etc. This goes along with the option of you wanting a creamier chicken curry mentioned above. Coconut milk is also a solution, should you find the Jaffna curry powder too spicy. I am from Germany and married with a Sri Lankan, so I am always looking for nice recipes. We are so happy that you share this wonderful recipes with everybody. Yesterday we made Jaffna Curry and the chicken. Sooooooooooooooo good. Thank you very much. Add the cleaned and washed chicken parts to a bowl. Make sure to drain any excess water. Add the turmeric powder, Jaffna curry powder, pepper powder, salt to season and tamarind juice to the chicken parts, combine, cover and set aside for 15-20 minutes(as long as you can). Place a wok or a pan large enough to hold chicken parts and gravy, let it heat over medium fire for a few seconds. Pour in the oil, then in the given order, add curry leaves, pandan leaf, onions, tomatoes, cinnamon, ginger-garlic paste, cardamom, green chillies and sauté the ingredients over medium heat(less than 5 minutes)or until they release their aroma. As the ingredients sauté, take out the marinating chicken pieces and gradually add these to the pan with tempering ingredients. Do not throw away whatever marinade liquid is left, we will be adding it to the curry later. Combine and let the chicken semi-fry with the tempering ingredients in the pan over medium heat for at least 7-10 minutes. Try to brown the chicken as much as you can while avoiding the chicken sticking to the pan. For this purpose, you can add a tablespoon of oil.10-15 minutes. Once the chicken turns slightly golden at the edges, pour in the left-over marinade to the pan. Then, add one and a half cups of water(depending on how much gravy you need, you can reduce it to one cup). Cover and slow simmer the curry for 45 minutes. 20 minutes into slow-simmering, check for taste and season with salt if necessary. Avoid increasing heat to cook the chicken faster, maintain low-medium heat and slow-cook until gravy reaches your desired consistency. Similar dishes chicken dishes you might like to try. Spicy deep-fried Indian chicken 65. Sri Lankan pepper chicken curry. Black pepper chicken in yogurt spice. 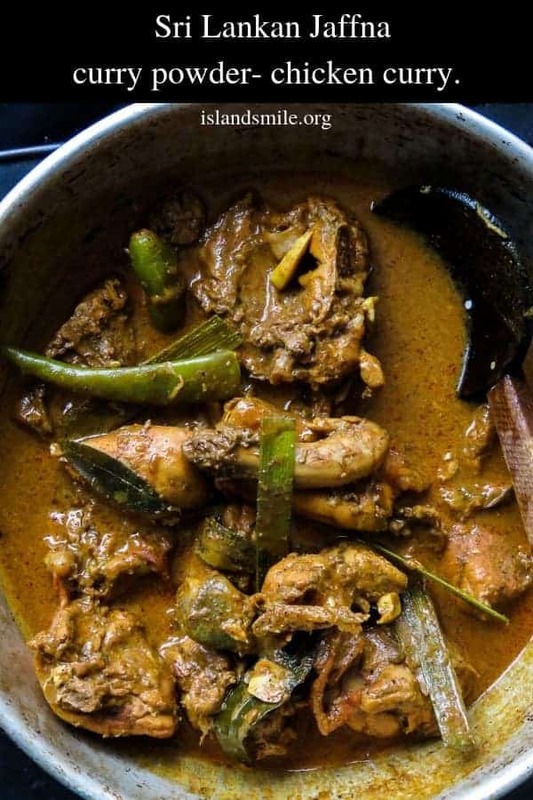 SRI LANKAN JAFFNA CURRY POWDER SPICY CHICKEN CURRY- YOU’VE MADE YOUR JAFFNA CURRY POWDER, NOW LET’S MAKE A CHICKEN CURRY WORTHY OF THE SPICE BLEND. Combine and let the chicken semi-fry with the tempering ingredients in the pan over medium-heat for at least 7-10 minutes. Then, add one and a half cups of water(depending on how much gravy you need, you can cut it to one cup). (If you prefer to add coconut milk and give it a creamier flavor, instead of adding water as instructed above, add a cup of coconut milk and continue with instructions given below).